At South Downs Secure Car Storage, on the Hampshire and West Sussex border, we offer added value to our clients. By working with a highly respected portfolio of trusted affiliates from within the automotive industry, we enhance the services we offer. Over the coming months, we aim to showcase some of these affiliates as part of a series of blog articles. For our first article, we caught up with Paul Townsend from Auto Curators. Paul is an expert in his field of car detailing. We believe that the availability of specialist car detailing is a vital part of secure car storage. It’s something we offer from our facility between Hampshire and West Sussex. Q: Firstly, Paul, how and when did you start operating Auto Curators? A: I founded Auto Curators in 2015, but before this, I had run Shine On Auto Detailing for nearly ten years. Q: What is it that makes Auto Curators so successful? A: A dedication to customer satisfaction, through excellent customer service and exceeding expectations. Q: What makes Auto Curators the best in the business? A: As a company, Auto Curators is results driven. We use high quality, well-tested products and take time to understand how to get the best results from these. By using both commercially available products, and some bespoke products that are made uniquely for us we achieve the best results. Also, we choose products and processes for their effectiveness; we don’t just follow industry fashion. Furthermore, we listen to our customers, identify what is most important for them, then build a service to accommodate that. Q: What do you think people should be looking for when they select a car detailing firm? A: First and foremost, they should be comfortable with the people they are leaving their car with, gut feeling counts for a lot. The firm should have a good portfolio demonstrating a wide range of skills, with references available if necessary. On a practical note, the detailing firm should be well insured while the car is in their care for all eventualities, as well as documented procedures for whom is responsible for its safekeeping. Q: How do your services increase the value of a car? A: We help to present a valued car in the very best way, often without having to resort to a body shop visit. This helps to maintain the originality of the vehicle. We protect the paint from an environmental ‘attack’ that may lead to degradation of a vehicle’s condition. Equally, where appropriate with some classic cars, we protect the car while maintaining a degree of original patina. Only a specialist car detailing firm can understand these requirements and achieve results. Q: What’s the most valuable car you have ever worked on? A: A Ferrari 250 SWB, once owned by Steve McQueen. It was worth approximately $12m. Q: What’s the most unusual task you’ve ever been asked to undertake in the business of specialist vehicle detailing? A: We have worked on cars, trucks, boats, helicopters and planes, all across Europe. We have often had to adhere to unusual working conditions at the request of clients. As an example, we once worked through the night for a member of a foreign royal family. I also worked on a Jaguar XK120 that belonged to L Ron Hubbard, founder of the Church of Scientology. 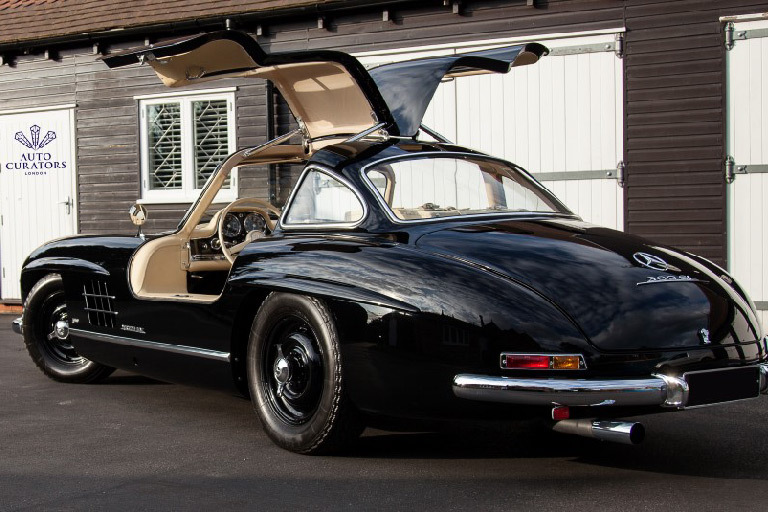 This was challenging, as the car had been restored in the States and returned to the UK in secrecy before its unveiling. I was one of just seven people in the world that knew of the commissioned project. I had to work on the car in absolute secrecy. It even involved temporarily removing the sign writing from our vehicle before going on site. Q: Why do you think Auto Curators and South Downs Secure car storage (on the West Sussex and Hampshire border) are a good alliance? A: We share a similar ethic, providing an exceptional service, founded on passion and commitment to our customers. Q: What benefits does the alliance between Auto Curators and South Downs Secure car storage bring to the customer? A: There are many firms to choose from in both fields, but having the confidence in one means you can have confidence in the other. We have both used our experience to identify why our affiliation is a good match, researching on the customer’s behalf. Q: Why do you think it’s important to use a professional car storage facility when a classic or supercar is not on the road? A: Meeting the correct environmental conditions are vital to a car’s condition. Extreme changes of heat and humidity can cause problems. Rubber seals and hoses, interior materials, and the paint finish itself can quickly deteriorate. Also, if a car isn’t stored in a professional facility, then unwanted visitors, such as insects or rodents, could be problematic. These can cause thousands of pounds worth of damage if they burrow into a car. Q: What services do you most frequently perform on a classic or supercar in professional car storage? A: We carry out a lot of paint correction. By carefully polishing the paintwork we can remove swirl marks, scratches. We can also rejuvenate dull paint finishes. Q: What do you think people should look for when they are selecting a professional car storage facility? A: Firstly, a person should ensure they are happy with the people running the facility. It’s important to feel comfortable with the person you are dealing with. You need to feel assured that your car will be safe in this person’s hands. Next of course is the facility itself. Take some time to ensure you are happy with how the cars are kept and the security arrangements. You should also ensure you will be able to enjoy your car, so ask about the process that takes place when you want to use your car. For clients looking for a car storage facility in West Sussex or Hampshire, South Downs Secure is an excellent choice!